There has been some discussion recently of a a report from Rabobank entitled “Rethinking the Food & Agriculture Supply Chain.” (Example) The world is entering at least a decade of agri-commodity scarcity, the author writes. Historically it’s been dangerous to predict prolonged periods of commodity scarcity. It happened in the 1970s during the inflationary period that in some ways is similar to today, and more briefly in the mid-1990s. I had an agribusiness executive tell me a couple years ago that this was the third promised ‘golden era’ of agriculture in his career. He said so with an ironic smile. Leaving aside the issue of commodity prices, there is a very interesting dynamic in agriculture today. That is the migration of the economic center of gravity toward the production side of the supply chain. how change is or is not introduced to the production, movement and transformation of commodities. I’ve always been of a mind that in many parts of agriculture and the food industry the economic center of gravity was among processors. This depends, of course, on the specific value chain you may reference. 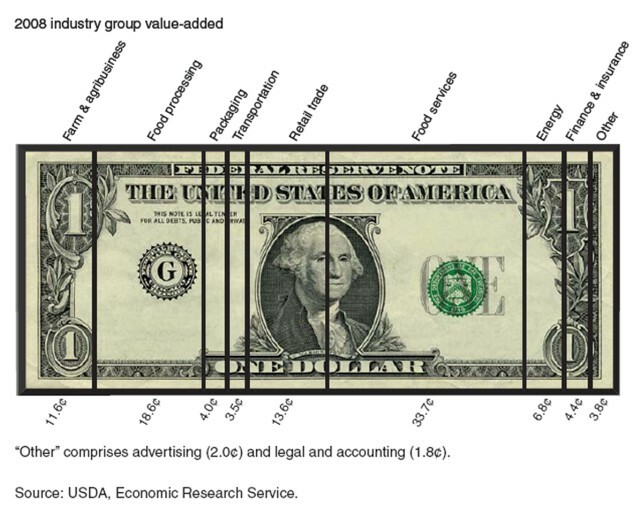 Specific value chains for soybeans, pork, and beef, for example, are representative of markets where economies of scale lead to formation of a handful of companies that process a significant proportion of industry output. More than just market share, however, the decisions made at companies like Cargill, Con Agra, Bunge, Smithfield and ADM have a very significant influence on how business gets done in their various value/supply chains. The USDA depicts the agrifood value chain in the graphic below. It represents an accounting of each supply chain industry group’s contribution to the value of food purchases in the United States. Farms and agribusinesses add 11.6 cents, food processing 18.6 cents, retail 13.6 cents, and food services 33.7 cents. Long term trends have seen a greater share of value being added to food dollars spent by food service, retail, and processing. This is a consequence of an increase in the amount of processed food consumed and the proportion of food dollars spent on meals away from home (about half). Food processors have, by nature of their location in the supply chain, a significant impact on how commodities move from the farm to consumers. They add value through changing commodity’s form and through delivering those transformed products to the right place at the right time. My observation is that, at least in some industry contexts, there is at least a minor shift in economic influence away from processors toward production agriculture. Economics dictates that returns flow to the most limited resource in a supply chain. In today’s environment, the most limited resource is not processing capacity. Rather it is production capacity of commodities. Evidence of this trend pops up in a number of circumstances. High and volatile commodity and food prices – The FAO’s food price index has come down since summer, but still sits at all-time highs, and has followed the roller coaster ride of commodity prices since 2006. This is particularly a concern in developing countries where food expenditures take up a significant proportion of household income. Land values – U.S. average farm real estate values have increased, according to ERS data, by more than 40 percent since 2006. In the heart of U.S. farm country, the rise is even more dramatic. Illinois farm land has increased over 200 percent since 2004. Iowa farm land has increased in value 34 percent since just last year. Investments in land and production capacity in developing countries – Investment in land and agricultural production capacity is taking place in a big way in countries with remaining land resources, in South America, Africa, and to a lesser extent central Europe and the former Soviet Union. Chinese agricultural investment has become an emerging feature in many parts of the world, for example. Examples of agribusiness investments in production capacity in developing countries is ample also. An example recently was Cargill’s purchase of Provimi. There are all kinds of emerging issues related to investment in these countries, including Brazil’s most recent efforts to gain more control on land ownership. How these issues will evolve is difficult to predict, but has significant strategic implications for agribusiness firms. I have met executives here in the U.S. and abroad in the last year that are making important decisions regarding investment and innovation that are impacted by the need to increase agrifood production capacity. Which assets to own? Which to sell? The location/origin of these assets? Where to partner and where to build internal capabilities and capacity? All these issues are important while keeping an eye on how to meet the demands of an increasingly segmented consumer marketplace.